You'll be £9.99 closer to your next £10.00 credit when you purchase Arnhem 1944. What's this? The 17th September 2009 marks the 65th anniversary of the start of the battle of Arnhem. 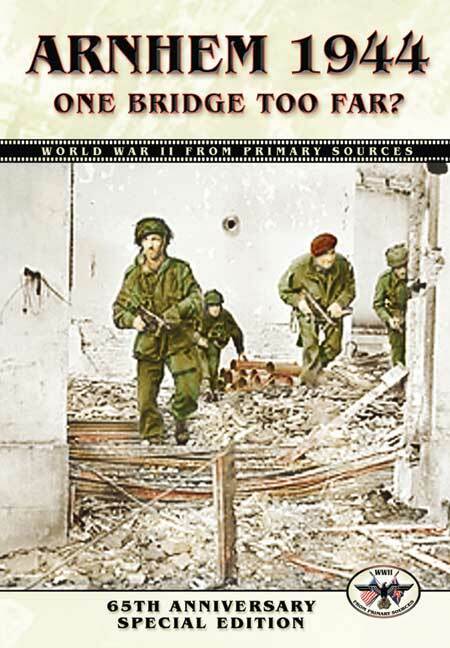 This is the tragic story of the last bridge in the ill-fated 'Operation Market-Garden', and features rare newsreel footage of the Allied operation that was supposed to end World War Two in 1944. General Montgomery's conclusion was that Market Garden was '90 per cent successful'. However, the rest of the world is divided and many historians regard this as Hitler's last victory in the war. The attack was in fact a disaster from the British point of view and represented the last victory in the war for Hitler's armies. Featuring extensive footage from the training films and newsreel cameras of both sides plus a return to the battlefield under the direction of Robert Kershaw, author of the best-selling book 'It Never Snows In September'. This is the powerful film account of an immortal episode in the history of warfare. A really good concise DVD. Recommended viewing.